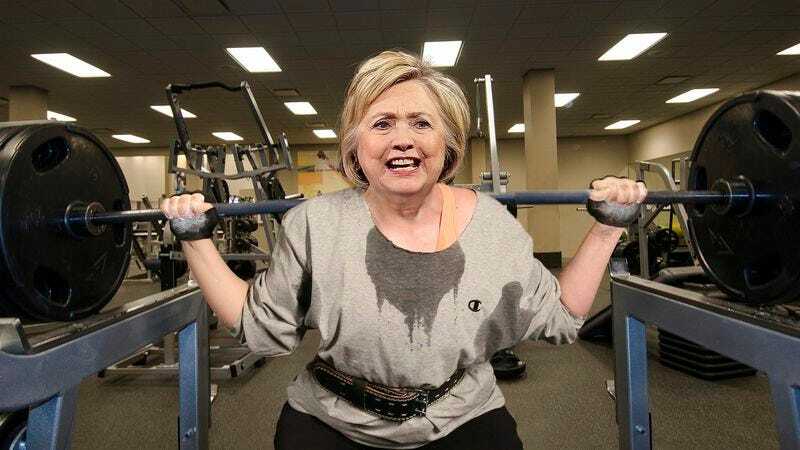 BROOKLYN, NY—Shaking violently as she fought to slowly lift the 225-pound load, Democratic presidential candidate Hillary Clinton reportedly set a new personal single rep squat record Friday while watching Bernie Sanders speak about the upcoming California primary on her gym’s television. “Push!” Clinton reportedly growled while hoisting the flexing, chalk-covered barbell into the air, locking her eyes on the screen showing the muted Vermont senator as sweat streamed down her flushed, contorted face and veins bulged along her neck. “Finish, finish, finish! Yaaaaggh!” Sources confirmed that after triumphantly slamming the barbell back onto the squat rack, the former secretary of state then clapped her hands once and flexed her right bicep at the footage of Sanders addressing a large crowd of supporters.